WARREN COUNTY — As she watched animals she had raised being loaded onto a truck headed to Oklahoma, Sandra Smith didn’t know whether to cry or smile. 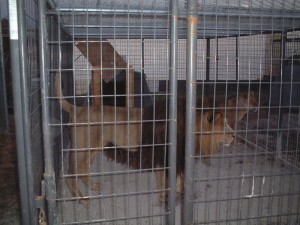 On Saturday, about 20 lions and tigers, two wolves, a mountain lion, a bear and a leopard departed for the G.W. 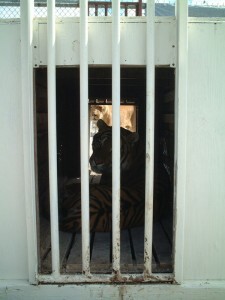 Exotic Animal Park in Wynnewood, Okla.
Smith found it difficult to watch 20 years of her life be packed into an 18-wheeler. they hope to do that in the next month. Joe Schreibvogel, the owner of the G.W. park said he is looking to help Wesa place the rest of its animals. Four of the big cats are headed to Carnivore Preservation Trust in North Carolina. The future of the others is up in their air, and Schreibvogel said he might have to make another trip here in case no one else can take in the tigers. Schreibvogel said his park has more than 170 big cats and 1,400 animals on 16 acres. He said Wesa had nice cages and their animals were healthy for the most part. The animals’ new home, though, will be an upgrade. Schreibvogel said his park is licensed by the U.S. Department of Fish and Game, the U.S. Department of Agriculture and Oklahoma. Wesa is no longer licensed on the federal level — the facility surrendered its USDA license in 2003. Smith didn’t deny her animals were going to a better home. She said Wesa wanted to create a better living environment for its animals, but the Smiths were unable to because of financial issues and pressure from animal rights groups and local citizens. Wesa was open to the public until 2003 when it forfeited its USDA license. Both Ken and Sandra Smith were on probation for various violations, such as the failure to register some animals and the failure to keep cages properly locked. 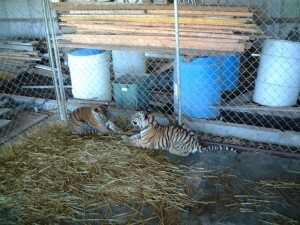 On Aug. 3, a 26-year-old man helping clean out cages was attacked by a tiger. Jacob Barr is recovering at Barnes-Jewish Hospital and is in fair condition after having his right leg amputated. Lisa Wathne, a spokeswoman for People for the Ethical Treatment of Animals, doesn’t think the animals will be any better off at the G.W. park. She said the fact that G.W. breeds and shows its animals is reason for concern, although Schreibvogel said it won’t affect how the animals are treated. The owner of the Wesa-A-Geh-Ya animal sanctuary in Warren County told county commissioners Tuesday morning he has decided to close his facility near Truxton following Sunday’s tiger attack which left a volunteer maimed. Kenneth A. Smith, 51, said he will attempt to place every animal in another shelter within the next 30 days. Authorities said Jacob Barr, a 26-year-old Warrenton man, was mauled by an 800-pound tiger while he was attempting to move the animal from a large cage into a smaller one. Barr had to have his right leg amputated just below the knee Monday at Barnes-Jewish Hospital in St. Louis. He was reported in satisfactory condition following the surgery, although additional surgery on the leg was performed Wednesday. Smith said he had contacted owners of animal sanctuaries in both Kentucky and Tennessee in an effort to place his animals in locations “where the laws aren’t so hard to deal with. Smith, who was to meet with the commissioners and the Warren County Planning and Zoning Board next Monday, asked the commissioners for time to complete the transfer of his animals. Asked how much time he would need, Smith estimated 30 days might be enough to complete the relocations. “If it takes more than a month, I’ll call the fish and game people, dig a hole in my back yard and put all the animals down,” Smith observed. In a statement released later Tuesday, the commissioners said they had advised Smith in 1995 that additions to his property would require the filing of a Conditional Use Permit with the county. “We have no record of any such request ever having been filed,” said Presiding Commissioner Arden Engelage. Smith said Barr was a new volunteer at Wesa-A-Gey-Ya. “He had just started,” Smith said. The Wesa-A-Geh-Ya sanctuary is located in northern Warren County off Highway A near the town of Truxton. The tiger, which was named Tony, scaled a 10-to-12-foot-high fence before it attacked Barr, authorities said. The animal was shot and wounded by Smith’s wife, Sandra, during the attack and was later killed by Smith himself. According to authorities, Barr’s leg had much of the skin stripped off down to bare bone. He was flown by air ambulance to the hospital. What frustrated sheriff’s department deputies about the incident was the fact Smith, his wife and other workers at the facility initially tried to cover up the attack. Harrison said his deputies finally found the body of the tiger at the rear of the Smith’s property. Deputies seized the carcass and are keeping it as evidence. While the incident Sunday might be described as an accident, Harrison said it cast a dark shadow over the operation of the sanctuary. The sheriff also said there will likely be extreme civil repercussions from the attack. The Smiths have operated the Wesa-A-Geh-Ya sanctuary for years. It was originally licensed as a zoo, where visitors could pay an admission fee and see the animals in their cages. But the Smiths had their operating license revoked by the United States Department of Agriculture (USDA) in 2003 following an investigation into numerous violations of the Animal Welfare Act. The Smiths also had to pay a $13,000 fine. A 2006 USDA investigation uncovered violations including the failure to provide minimally adequate veterinary treatment, a lack of training for employees, unsanitary food storage, unsafe caging for the animals, unsanitary drinking water, failure to have perimeter fencing sufficient to safely contain dangerous animals and the general inhumane treatment of the animals which existed on the property. “This was an accident waiting to happen,” said Debbie Leahy, director of the Captive Animals Rescue and Enforcement organization. “Wesa-A-Geya-Ya has a long history of abuse and neglect and has been cited repeatedly by the USDA for unsafe caging. On Monday, Leahy wrote to Benito Perez, the chief of law enforcement for the U.S. Fish & Wildlife Service, calling for a thorough investigation of the entire incident. In her letter, Leahy said she also is concerned by what she called the “unexplained disappearance” of endangered species in Wesa’s animal inventory. In June of 2007, Wesa had 40 animals registered with county authorities according to Leahy. But only 35 animals were found there during an on-site investigation that same month. The sanctuary currently includes an estimated 50 animals, including lions, tigers, bears, wolves and a leopard. Kenneth Smith is currently on probation for failing to register some animals. Sandra Smith received probation in 2003 after she was charged with failing to keep the animal’s cages properly locked. ST. LOUIS – Two tiger attacks this week at two different Missouri animal facilities that had both been cited for past problems have law enforcement officials calling for tougher exotic animal laws. On Monday, a 16-year-old worker entered a tiger pen at the Predator World attraction in southwest Missouri to take pictures for a visitor and was attacked by three of the big cats. The boy, Dakoda Ramel, remained in critical condition Tuesday at a Springfield hospital. There was no immediate response to a call seeking an update on his condition Wednesday. Just the day before, a separate tiger attack in eastern Missouri cost a 26-year-old volunteer part of his leg. Jacob Barr’s leg below the knee was amputated after he was attacked by a tiger Sunday at the Wesa-A-Geh-Ya animal facility in Warrenton. Barr faced more surgery Wednesday at a St. Louis hospital. Federal officials have pointed to problems at both facilities. A 2007 U.S. Department of Agriculture inspection at Predator World noted three instances of animals getting out of their pens: two wolves that escaped into the community; a grizzly bear that remained on the property but was able to kill a tiger; and a fox that was hit by a car. The Wesa-A-Geh-Ya facility, which used to have a license to exhibit its animals through the USDA, surrendered that license in 2003 and then had it revoked after a number of violations involving animal care were alleged. Critics say a patchwork of laws means no single agency in the state or nation is responsible for law enforcement and inspections related to exotic animals like large carnivores. One of the tiger owners, while deeply upset by the tiger attack, said she thinks existing regulations contributed to the problem. Warren County Sheriff Kevin Harrison said he’d like the state to improve exotic animal laws, but in recent weeks he proposed changes at the county level. “I think it’s such a politically charged topic: What do you do with these exotic animals?” he said. 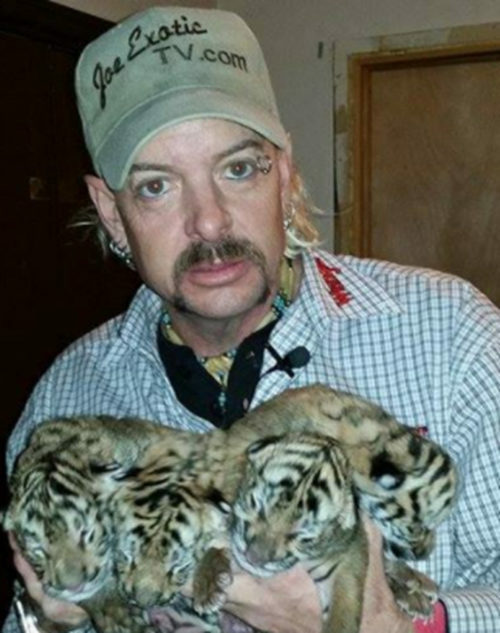 Both Harrison and Stone County Sheriff Richard Hill, where the other tiger attack took place, said in Missouri owners are supposed to register their exotic animals with their sheriff’s department. But they said the law doesn’t specify how soon after possessing an animal someone must register. The law also lacks requirements for proper enclosures, or how often the registration needs to be updated. The Missouri Department of Conservation visits Wesa-A-Geh-Ya at least annually to check on animal species that are native to the state, like mountain lions, wolves and a bear — though the wolves at Wesa-A-Geh-Ya are Arctic wolves. “There’s never been any problem with them mistreating the animals or problems with the enclosures,” said Dan Zarlenga, a spokesman for the Department of Conservation. 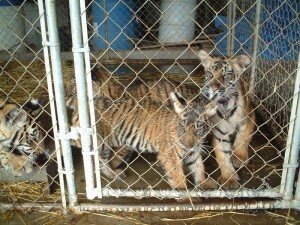 But the agency does not inspect animals not native to Missouri, like the tigers. Sandra Smith, one of the owners of Wesa-A-Geh-Ya, said existing regulations are confusing and problematic. She said she had wanted to make cages more secure but was told she couldn’t without a local permit. “If there’s going to be more regulations, put someone on the job who knows what they’re doing,” she said. Smith said she’s getting out of animal care altogether. She said she’s started looking for new homes for the 49 animals on her property. Harrison said Wesa-A-Geh-Ya owners needed to take responsibility for the tiger attack, saying they were the ones who decided to house wild animals on the site behind chain-link fences. Predator World did not respond to requests for comment. The USDA report on Predator World, provided to The Associated Press by the People for the Ethical Treatment of Animals, notes that two of the previous animal incidents at the facility occurred during storms. Hill said that if exotic animal owners don’t register the creatures, authorities will not have accurate, updated information about what potentially dangerous animals are residing in their counties during severe weather. Wesa-A-Geh-Ya, an exotic animal center in Warren County, was the site of a mauling Sunday. Owner Ken Smith told the Warren County Commission on Tuesday he plans to close the facility and send the animals to a sanctuary in Kentucky. 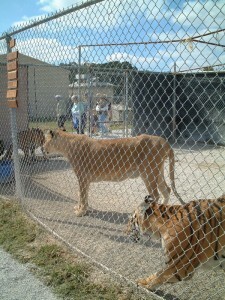 Wesa-A-Geh-Ya owner Ken Smith announced Tuesday his plans to close the exotic animal center located in Warren County. The decision spurs from Sunday’s tiger attack on volunteer Jacob Barr, the center’s lack of funding and past and present legal problems, Smith said. Barr, 26, of Warrenton was assisting another volunteer at the center in moving the tiger, named Hercules, from his cage for cleaning purposes when the tiger jumped the fence and attacked Barr, Smith said. Barr was taken by helicopter to Barnes-Jewish Hospital in St. Louis, where he underwent surgery. Hospital officials said Tuesday that Barr had lost his leg below his knee, and was in fair condition. When deputies with the Warren County Sheriff’s Department first arrived at Wesa-A-Geh-Ya after the mauling, they were led to believe Barr was attacked by a stray black and white pit bull that had been scared off by gunfire, Sheriff Kevin Harrison said. After leaving the wildlife center, Harrison received a tip from a friend of the victim’s father, who said Barr was attacked by a tiger, which Smith had shot multiple times, killing it, and then put the body in a truck and transported it to a family member’s house in New Truxton, Harrison said. After authorities returned to speak with Ken and Sandra Smith and volunteers about the new information, they acknowledged the incident was a tiger attack, Harrison said. Ken Smith said the volunteers made up the pit bull attack story because they didn’t want to get the animals in trouble. 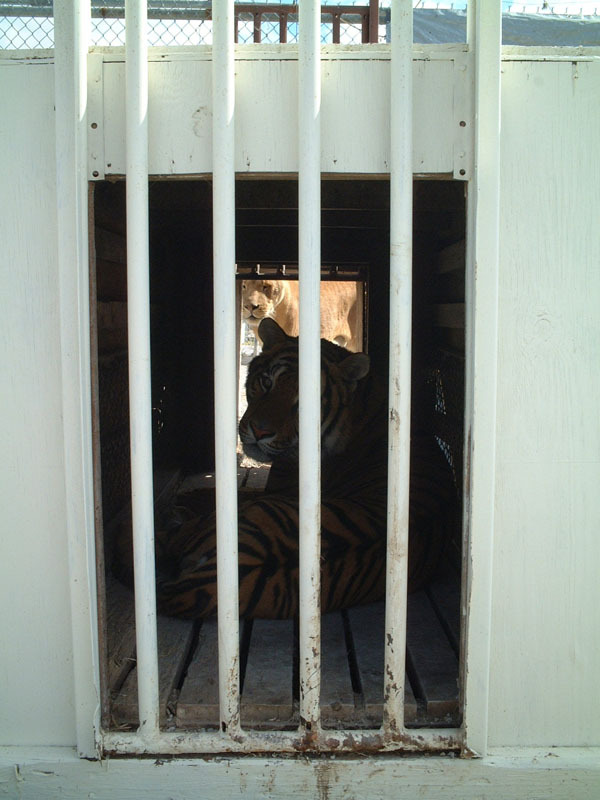 The tiger’s body then was voluntarily surrendered to the sheriff’s department, which turned it over to the University of Missouri-Columbia veterinary school for an autopsy and to properly destroy the remains. Smith said Tuesday the tiger that attacked Barr was Hercules — not Tony, as had been previously reported. 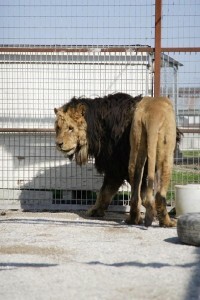 Hercules had been rescued before living at the facility, Smith said. But Dangerous Wild Animal Registration Forms filed with the sheriff’s department list Tony and Hercules as cage mates and both being born at the facility. Smith said if he had to kill every animal at the center to get the “young man’s” leg back, he would. “I was lucky we didn’t lose anyone’s life over it,” he said. Smith told commissioners all the exotic animals at Wesa-A-Geh-Ya and their cages will be sent to a sanctuary in Kentucky, where they will receive better care and more legal protection. Harrison said Smith’s decision, if followed through with, is in the best interest of the county and ultimately the more than 55 animals at the facility including tigers, lions, arctic wolves and a bear. Wesa-A-Geh-Ya has been the focus of legal dispute in the community for several years. In 2004, the Smiths relinquished their U.S. Department of Agriculture license after the organization alleged the center did not have proper veterinary measures in place and did not employ properly trained staff. The move closed the center’s doors to the public. Ken Smith was found guilty in May of not properly registering more than 55 animals at the facility. The ruling also determined that the facility was not an animal sanctuary. On Tuesday, Smith entered a plea of guilty to Circuit Court Judge Wesly Dalton for failing to properly maintain accurate records as a wildlife breeder with the Missouri Department of Conservation and was required to pay up to a $100 fine. But during interviews Ken Smith has consistently maintained his innocence. The Smiths have said that in the facility’s 21 years of operation, an animal has never escaped from the grounds. The facility first existed as a breeder in 1987 and then as a not-for-profit in 1998. Sandra Smith said Sunday’s incident may have been prevented if the center were allowed to put in additional safety measures it requested, including a cover for the cages and a 12-foot chain-link fence surrounding the site’s 3,000-square-foot perimeter. The Warren County Planning and Zoning Commission did not allow these changes, she said. Ken Smith added that as a caretaker of exotic animals, he can’t wait 30 days for the zoning commission to make a decision on whether he can make a cage bigger. “I have to react to what the animal is telling me right then,” he said, otherwise someone gets hurt. 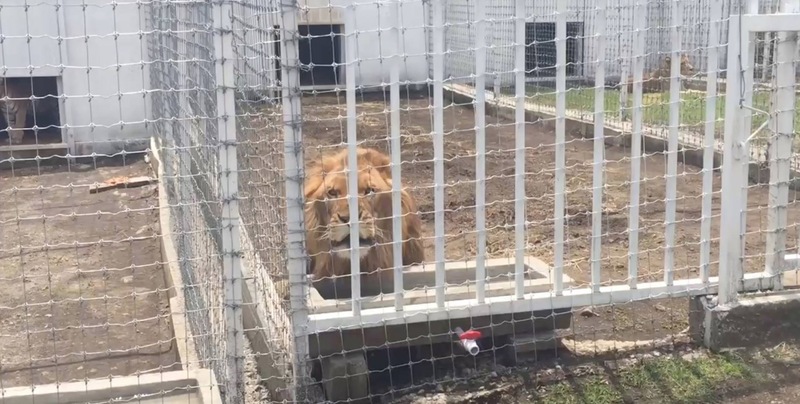 County officials including Presiding Commissioner Arden Engelage and Planning and Zoning Coordinator Linda Gant told Smith Tuesday that nothing prohibited him from putting tops on existing cages. Commissioners initially declined to comment, citing a pending investigation involving planning and zoning and the Smiths, but Engelage issued a prepared statement after Smith announced he would close the facility. ST. LOUIS (AP) – Two tiger attacks in Missouri have law enforcement and animal agencies calling for tougher exotic animal laws. They say a patchwork of laws means no one agency is responsible for inspections and enforcement related to exotic animals. A 16-year-old worker entered a tiger pen at the Predator World attraction in Branson West yesterday to take pictures for a visitor and was attacked. The teen, Dakota Ramel (RAM’ ehl), remains in critical condition at a Springfield hospital. In a separate incident, a 26-year-old volunteer, Jacob Barr, had part of his leg amputated after he was attacked by a tiger Sunday at the Wesa-A-Geh-Ya (WAY’-suh ah GEE’-yah) animal facility in Warren County. He is in satisfactory condition at a St. Louis hospital. Investigations continue. No one has been charged in either instance. Warren County resident Rosella Baller only wants county officials to enforce the rules regarding the registration and upkeep of exotic animals. Doing so might be easier said than done, the commissioners said Monday. That’s because the commissioners, along with the U.S. Department of Agriculture (USDA) and the Missouri Department of Conservation, are still trying to figure out what the rules are. At issue is whether an animal sanctuary – a 17-acre parcel of land called Wesa-A-Geh-Ya – owned and operated by Ken and Sandra Smith in northern Warren County has been properly registering its animals with the Warren County Sheriff’s Department. Ken Smith, of Highway A between Interstate 70 and New Truxton, was charged by Warren County Prosecuting Attorney Mike Wright on June 1 with one count of keeping dangerous wild animals without registering with local law enforcement. The charge is a misdemeanor. The Smiths could not be reached for comment. Ken Smith has a court date scheduled for Aug. 21 before Associate Circuit Judge Wesley Dalton. Until then, Presiding Commissioner Arden Engelage said, there’s not much the county can do. He said the commission sent Baller’s complaints and mounting evidence – a pile of papers going back seven years – to the county attorney last week. Engelage said he didn’t know when he might hear from county counsel. The situation might resolve itself in court, he said. Baller, who lives near the Smiths, said it was nearly impossible to ensure the Smiths were following the law and registering their animals – which include nearly 60 lions, tigers, wolves and cougars. Baller suggested Monday the county commissioners should adopt an ordinance requiring exotic animal owners, such as the Smiths, to insert microchips into each animal. That would help identify an animal’s owner should one escape, she said, and keep track of the animals in captivity. Northern District Commissioner Jim Logan said that wouldn’t fix the registration issue because a female animal could have babies – which, of course, wouldn’t be born with the microchips. Baller pointed out this is not a new issue. The Smiths were cited for roughly three dozen violations of the Animal Welfare Act in November 2004 by the USDA. Those complaints, which were administrative in nature and not civil or criminal, were settled early last year. The Smiths agreed to a $13,000 fine and two years’ probation. 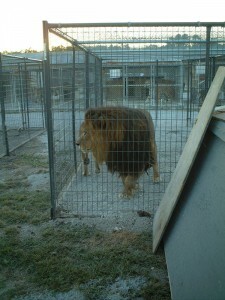 The USDA said the Smiths operated “a dilapidated backyard animal menagerie” which “masquerades as a sanctuary while breeding lions and tigers and confining animals to small, barren cages,” according to a report from www.bigcatrescue.org, a Florida-based sanctuary and educational facility. The USDA report filed in 2004 said the Smiths “failed to provide minimally adequate veterinary care.” Examples of that substandard care included a malnourished bear with sores on the pads of both front feet, a young lion who was “lethargic, cold to the touch and dehydrated,” a lion with bite wounds on its legs and a tiger whose hind legs were paralyzed. Warrenton, Mo. 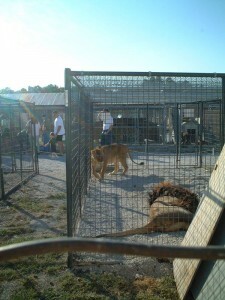 – The U.S. Department of Agriculture (USDA) has filed multiple charges against Wesa-A-Geh-Ya, a dilapidated backyard animal menagerie in Warren County, Mo., which masquerades as a sanctuary while breeding lions and tigers and confining animals to small, barren cages. The USDA launched an investigation and charged Wesa with violations of the Animal Welfare Act after PETA filed a formal complaint with the agency in June 2003, based on eyewitness reports of atrocious conditions at the facility. The USDA also found maggot-infested food storage with foul-smelling, rotten meat; unsafe caging; inadequate shelter from inclement weather; unsanitary drinking water; and insufficient perimeter fencing for dangerous animals. Wesa’s menagerie includes more than 65 animals, including tigers, lions, cougars, wolves, and a bear. In December 2003, PETA also filed a formal complaint with the Missouri Attorney General’s Office, asking that it declare Wesa in violation of the Missouri Nonprofit Corporation Act. 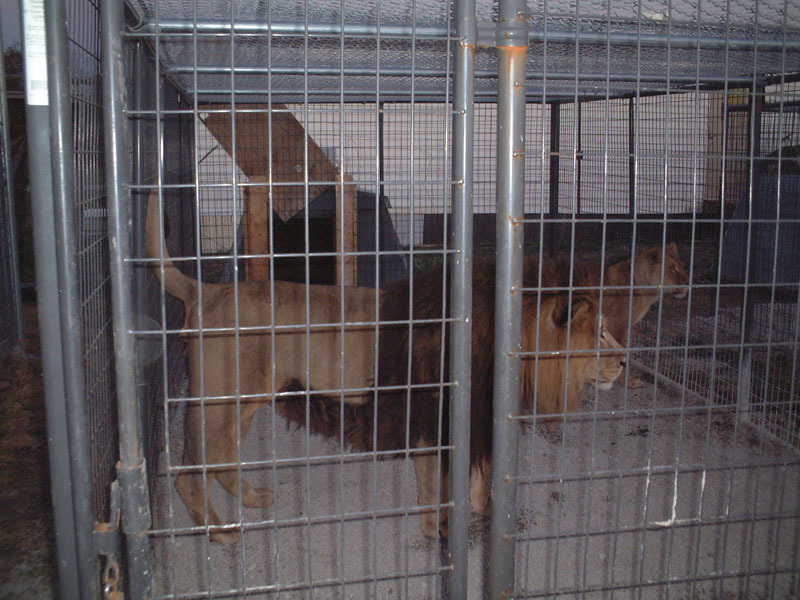 The attorney general determined that Wesa was in violation of state law for continuing to advertise as a zoo after forfeiting its USDA exhibitor’s license. 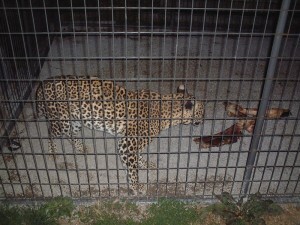 For more information, please visit PETA’s Web site WildlifePimps.com. is not accredited by The Association of Sanctuaries. Check for yourself to see if they meet the sanctuary standards for an accredited animal refuge. .com/articles/2007/08/04/news/sj2tn20070801-0801wa r_zone.ii1.txtKen Smith, of Highway A between Interstate 70 and New Truxton, was charged by Warren County Prosecuting Attorney Mike Wright on June 1 with one count of keeping dangerous wild animals without registering with local law enforcement. The charge is a misdemeanor. Update January 2005: The U.S. Department of Agriculture (USDA) has filed multiple charges for violations of the Animal Welfare Act against Wesa-A-Geh-Ya. The USDA also found maggot-infested food storage with foul-smelling, rotten meat; unsafe caging; inadequate shelter from inclement weather; unsanitary drinking water; and perimeter fencing that was insufficient to safely contain dangerous animals. In December 2003, PETA also filed a formal complaint with the Missouri Attorney General’s Office, asking that it declare Wesa in violation of the Missouri Nonprofit Corporation Act. The attorney general determined that Wesa was in violation of state law for continuing to advertise as a zoo after forfeiting its USDA exhibitor’s license and notified Wesa that it must amend its articles of incorporation and advertising. Down a rural road 60 miles west of St. Louis, in Warrenton, Missouri, sits a collection of haphazardly constructed dog runs at a facility called Wesa-A-Geh-Ya (Wesa), operated by Ken and Sandra Smith. 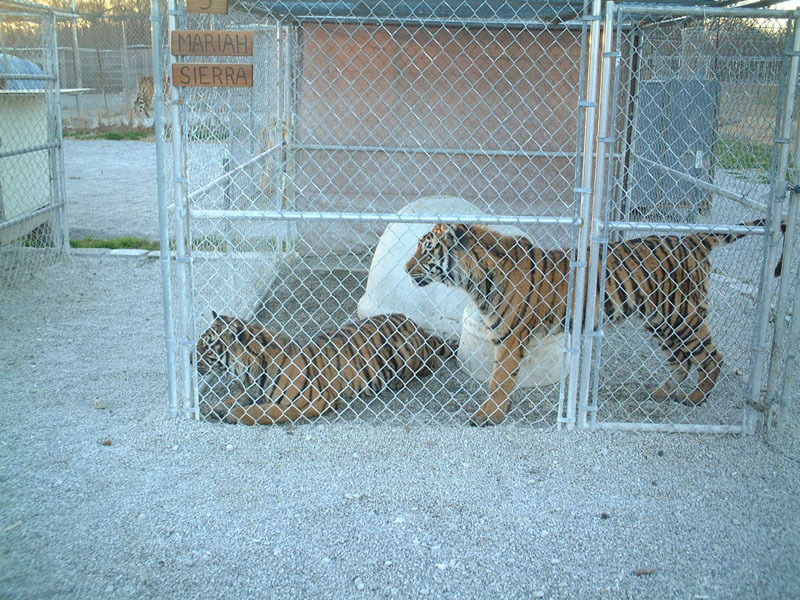 At first glance, Wesa appears to be yet another backyard puppy mill so prevalent in the Midwest-but its dilapidated, barren cages aren’t filled with neglected and overbred dogs; they’re crowded with an estimated 63 tigers, lions, cougars, wolves, and other exotic animals. Warehoused, the animals have neither environmental enrichment nor adequate space to exercise. Wesa is a classic roadside zoo and backyard breeder of big cats that masquerades as a sanctuary, preying on people’s sympathy to collect donations while exploiting the animals in its care. Whistleblowers-many of them former board members and volunteers-have come forward with shocking and persistent complaints of overbreeding, inbreeding, abuse, animal disappearances, malnourishment, neglect, and preventable animal deaths. 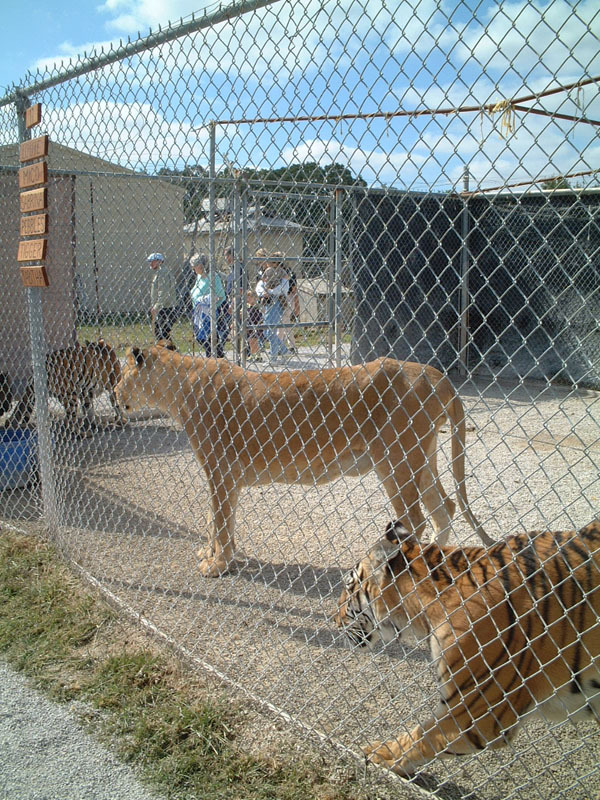 State officials charged the facility with violating caging laws, and Wesa has been repeatedly cited by the United States Department of Agriculture (USDA) for failure to provide adequate veterinary care, failure to provide adequate shelter from inclement weather, improper food storage, sub-standard perimeter fencing, poor construction of animal enclosures, and unsanitary conditions. 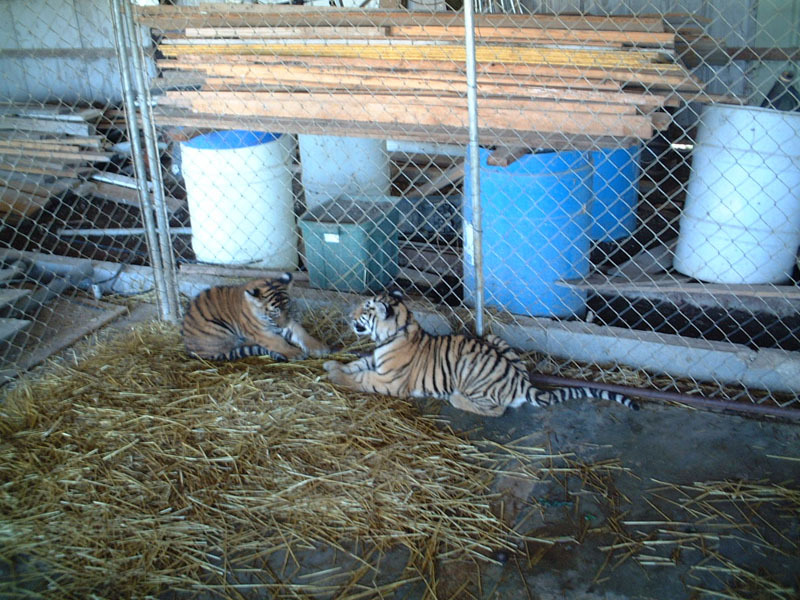 Witnesses report animals dying slow, agonizing deaths without any veterinary care, including an 18-year-old tiger who lay in her cage for more than a month, not eating or drinking. She withered away to skin and bones until she died. A black bear cub was in so much pain with raw and bleeding wounds on the soft, tender pads of her paws, apparently caused by living on rough gravel, that she actually tried to walk on the tops of her front paws. After being shot and killed by the Smiths, a sick horse was found to have had an untreated broken hip. A goat who approached a wolf cage to eat straw out of sheer starvation was badly injured when the wolf attacked, perhaps out of hunger. Volunteers claim that the animals are often fed only once every five days. 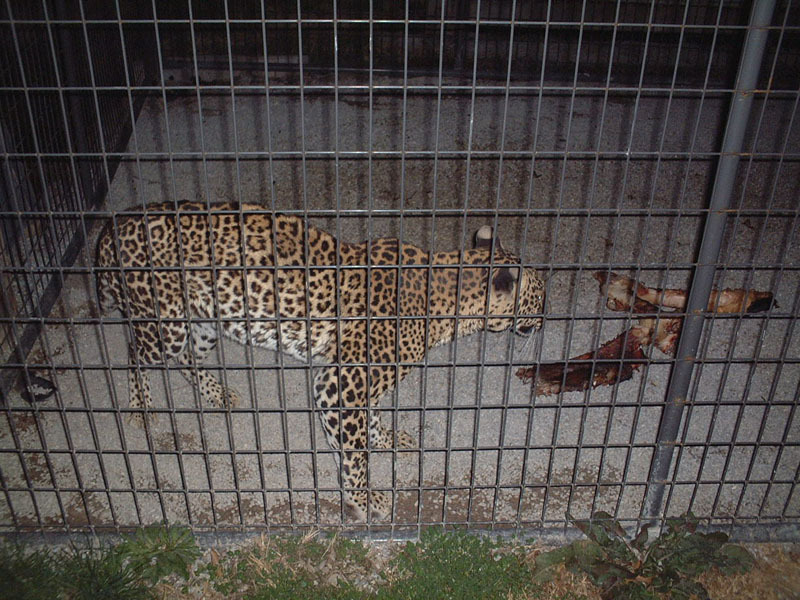 An animal nutritionist, funded by a local veterinarian concerned about the animals’ care, had found vision problems attributable to vitamin A deficiency; bowleggedness in big cats from rickets, metabolic bone disease, or vitamin A deficiency; unsanitary food storage; and failure to provide enough time between pregnancies to allow animals’ nutritional stores to recover. A former board member reported seeing Ken Smith punch, hit, and kick the animals on numerous occasions. In one instance, Smith repeatedly kicked three lion cubs in the face and head because they jumped on him when he entered their cage. A veterinarian who visited the facility was appalled at the shocking conditions: “Animals were cramped in crowded cages. Males were not separated from females, encouraging breeding. . The animals had nothing in their tiny enclosures for enrichment. Cages were barren, with cement or gravel floors. Ken and Sandy Smith did not seem to care about enhancing the lives of the animals.” In fact, conditions are so overcrowded that a former board member reported four cougars were stored in a horse trailer for an entire year before being moved to a cage. Jeffrey was a young lion cub who suffered and died because of Wesa’s apathy and greed. According to volunteers, Jeffrey was not given enough to eat so he consumed straw, gravel, and bone that caused an impaction. Over several weeks, Jeffrey lost weight and grew listless. In August 2002, Jeffrey was obviously in severe pain and deteriorating. Volunteers expressed concern to the Smiths, who not only refused to seek veterinary care for Jeffrey, but also denied permission for a volunteer to take him to a veterinarian. Fearing Jeffrey was on the brink of death, the caring volunteer finally rushed Jeffrey to a vet hospital anyway. 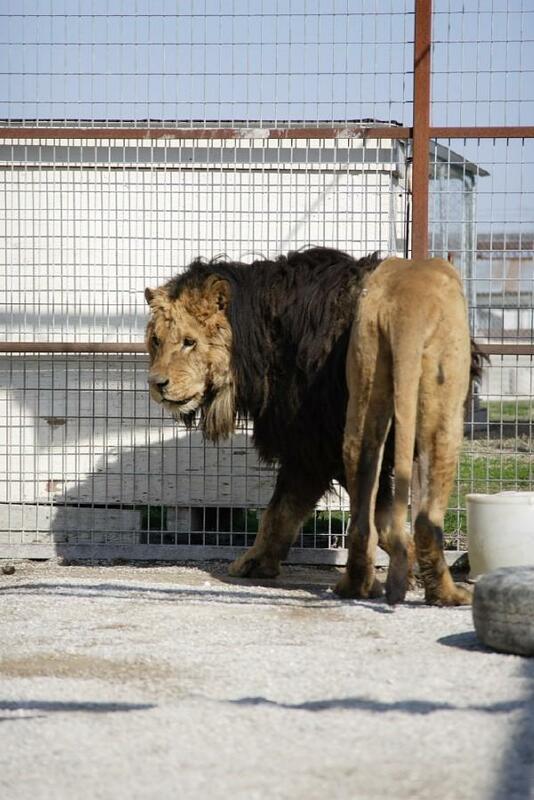 The veterinarian who treated Jeffrey wrote, “[Jeffrey was] gravely ill … On presentation, this lion appeared to be dying. His body temperature was 96°F, and he was virtually lifeless. . A large foreign body mass was found in the stomach.” The lion cub was operated on, but it was too late. Jeffrey died following surgery. Despite overwhelming evidence that Wesa had failed to provide adequate care to Jeffrey in the form of wholesome and ample food and health care, and therefore was in direct violation of Missouri’s cruelty-to-animals statute, the county prosecutor declined to prosecute the facility for Jeffrey’s unnecessary suffering and tragic death. In violation of any legitimate sanctuary’s guiding principles, Wesa breeds animals in order to remain well stocked with cute babies to draw visitors to the backyard menagerie and to sell for a profit. No legitimate sanctuary would make a bad situation worse by breeding and selling exotic animals. Volunteers report that more than half of Wesa’s “rescued” animals were actually born there. And it has been documented that the zoo has sold at least a few animals to a man who was recently convicted of selling and slaughtering tigers and leopards to sell their meat and skins on the black market. In addition to breeding animals, Wesa-A-Geh-Ya engages in the harmful practice of prematurely removing baby animals from their mothers, which is psychologically cruel to both the infants and their mothers and deprives the babies of proper maternal care and normal development. 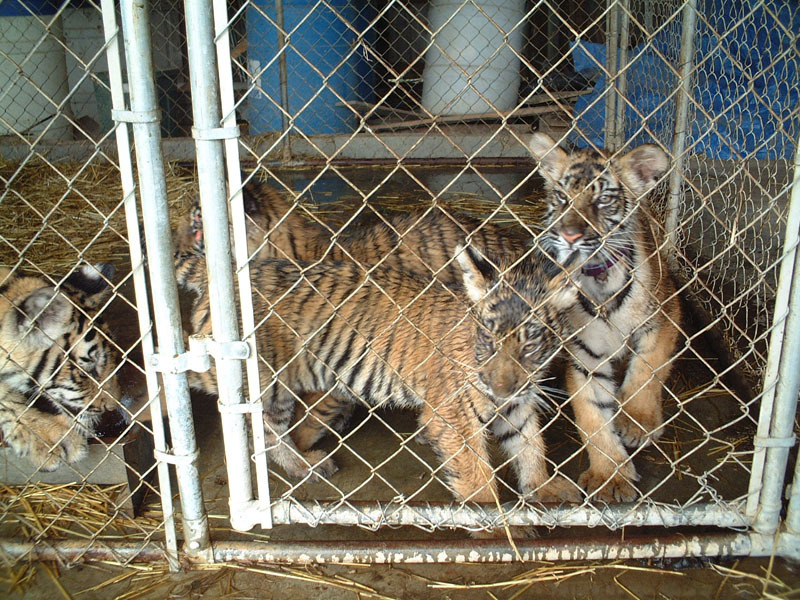 The lion and tiger cubs have been sold or carted around to state fairs where people pay to have photos taken with them, a practice that perpetuates the exotic pet trade by inspiring others to obtain wild animals. The additional stress of transport, excessive handling, confusion, and other unnatural aspects of these events puts further stress on the babies’ delicate immune systems and increases the chances of their becoming ill. No legitimate sanctuary would ever tear babies from their mothers or take animals off site except for medical reasons. PETA has filed a formal complaint against Wesa with the Missouri attorney general for violations of the state Nonprofit Corporation Act and deceptive trade practices. PETA is asking that Wesa’s nonprofit status be revoked and that Wesa be required to immediately terminate all public and private deception, fraud, misrepresentation, and use of false pretenses in connection with the solicitation of funds for charitable purposes or, in the alternative, face criminal prosecution. PETA is also asking that Wesa’s assets, including the animals, be placed in receivership for their own protection. Please write a polite letter to U.S. Department of Agriculture officials. Thank them for thoroughly investigating and pressing charges against Wesa-A-Geh-Ya. Urge them to pursue aggressive prosecution of this case and to levy the maximum penalties possible against Wesa-A-Geh-Ya. No genuine sanctuary would make a bad situation worse by engaging in or condoning commercial activities such as breeding, buying, selling, and exhibiting animals or by keeping animals in deplorable, overcrowded, neglectful conditions. Please contact PETA (e-mail CaptiveAnimals@peta.org) for help in combating pseudo-sanctuaries in your area.